Why do I need a burial container? In my conversations with families about cemetery burials, I find that many don’t know about the outer burial container – commonly called “vaults” – or don’t understand why we have them. So I’d like share a little about these containers that began as a form of crime prevention (more about that in a moment) and now are used daily in both traditional full-body burials and in burying cremation urns. First, what they are… Modern burial vaults are lined and sealed receptacles that house and surround the casket or urn on all sides. They are similar to grave liners; the main exception being that grave liners only cover the top and sides of the casket. The outer containers are typically made of reinforced concrete and are often combined with lining materials such as bronze, copper, stainless steel, and high-impact plastics. It’s important to note neither vaults nor liners prevent the eventual decomposition of human remains. So why do we have them? It’s not because of the law. Most states (including Texas) do not require outer containers, but most cemeteries do. This is covered in the Texas Health and Safety Code (Section 714.001.01). 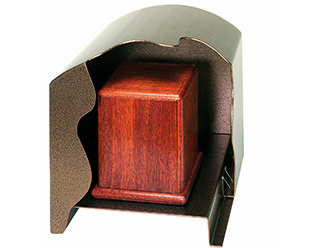 A fully sealed burial container helps protect the casket and its contents from things that might cause underground damage including tree roots. But the main purpose of both vaults and liners is to protect the top of the graves. Over time, buried caskets will collapse under the weight of the soil and heavy machinery used to dig new graves and maintain the cemetery grounds. When the casket collapses, the soil above it tends to fall several inches, which can damage the equipment and hurts the beauty of the cemetery. The same concept applies to buried cremation remains, albeit on a smaller scale. So you may be wondering about that “crime prevention” tease I mentioned. Burial vaults started as a means of discouraging grave robbers. The vault kept the thieves from easily getting to valuables, clothing, or even bodies. Early vaults were made of wood but were soon upgraded to tougher materials, including brick, iron and steel. By the time it became less common for families to bury their loved ones with jewelry, cemetery owners and managers had seen the structural value of the underground containers and their use became even more widespread. Of course, not all cemeteries require vaults or grave liners. Some “green” cemeteries reject outer containers and offer natural options that are more environmentally friendly. Others are considered hybrid cemeteries where both natural and traditional burials take place, often in different parts of the property. There are a number of outer burial containers choices, so I encourage you to talk with one of our helpful professionals at Local Cremation and Funerals and determine which one will be best for you or your loved one.